Jumping rooftop to rooftop, the silent silhouette inspires curiosity. She is quick, light and agile. Illustrator Sho Murase found her, brought her to the deep catacombs of DC Collectibles and gave her a form, life, and at almost 7-inches in vinyl, a style unlike any you've ever seen. You're curious, he can tell…it's kind of her thing, she's Catwoman. 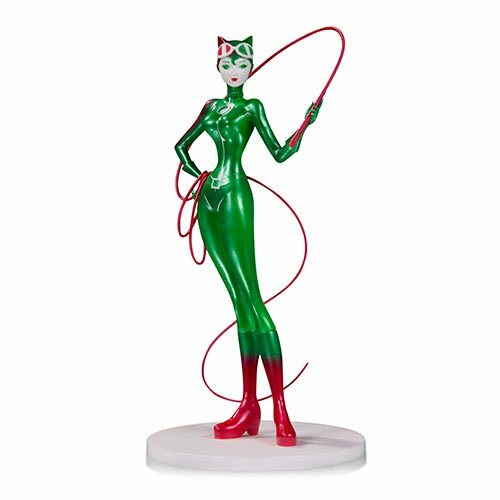 The DC Comics Artists' Alley Catwoman Holiday Variant by Sho Murase Designer Vinyl Statue features her in festive green and red colors.